Best Hair Gel for Men: How To Get The Strongest Hold and Ultimate Shine? What do you use to give your hair the strongest hold ever? Exactly – hair gel for men. And how to use it properly so that your mane stays healthy? Are hair gels harmful to your locks? 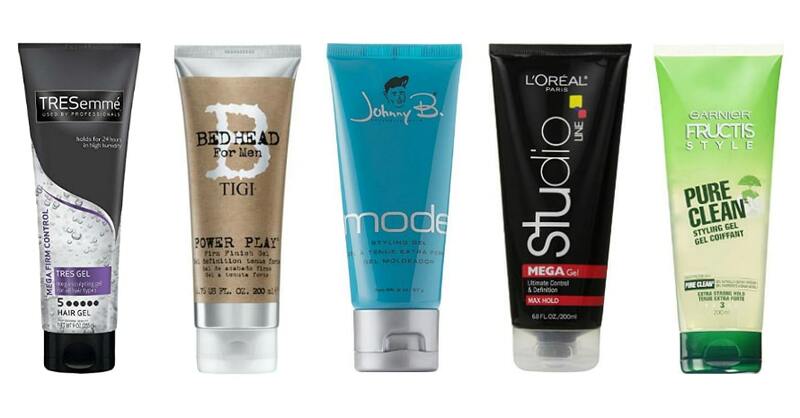 What is the best hair gel for men on the market? Let’s find out! Hey there! It’s Monica, professional hair stylist and founder of Mystraightener.com. Here I write about hair products for both men and women, and today we’re going to explore the variety of men’s hair gels. I’ll review my favorite products and give you some handy tips on how to choose the right hair gel for you. 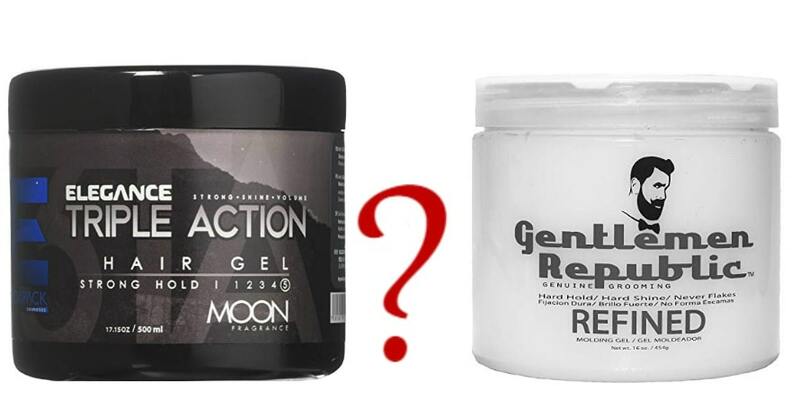 Since you need some time to get the knack of this product, I’m going to tell you how to use a hair gel for men and answer some of the most asked questions about it. Boy, do we have a lot to discuss! Looking for the strongest hair gel to make sure your hold will last throughout the day? Do you need a gel for curly hair men to tame your curls? Wonder what the best hair gel for black men with thick ethnic hair is? Find the answers to all of your questions in my newest post. 1 How to Choose a Hair Gel for Men? 3 Homemade Hair Gel for Men: How to Make It and What Are the Benefits? How to Choose a Hair Gel for Men? Your hair length, texture, overall state, and so on. There are hair gels made specifically for thick or fine, curly or straight, short or medium-length hair. Every hair type requires styling products that work best for it, so spend some time to find the perfect hair gel for you – it’s totally worth it. The general rule here is the thinner your hair, the lighter the product. Strong gels can weigh down fine locks. The hold factor. Make up your mind – do you need an extreme hold that lasts all day and even the next morning or you will be satisfied with a light or medium hold that lets hair look more natural? There is a whole range of hair gels, from those that promise you an extremely firm hold to those that give you more natural appearance. Shine. Do you want your hair to sparkle in the sun meeting the eye of the strangers? Or you’re the one to pref5er a matte finish? When some products promise to give your hair the ultimate shine, others bet on the natural, matte appearance. It’s totally up to you. Ingredients. It’s not so easy to find an all natural or organic hair gel, but many of them contain at least some beneficial ingredients. Panthenol, castor oil, jojoba seed extract, babassu seed oil, you name it. And it’s better to choose from alcohol-free products – they are less likely to dry your hair and scalp. Weather. If you live in a region with high humidity, you know how hard it is to find a styling product that will keep your hair in place. Same goes for wind – not all hair gels are strong enough to withstand the blowy day. Check out the products that are humidity-resistant and provide a firm hold. Your lifestyle. It’s pretty obvious: if you go to the gym on a weekly basis, spend lots of time outside or don’t have an opportunity to refresh the hairstyle every morning – you need a hair gel with a very strong hold that can last all day long. Price. As always, walk the line. Cheap hair gels should ring alarm bells, although there are some decent products among them. And the other way around – the expensive ones can seem high-quality and efficient, but they may disappoint you. Also, when it comes to pricey hair gels, there is a chance of coming across a fake. It’s a hair gel for those who like medium, yet flexible styles. Its thick formula is strong enough to hold hair in place, but you need just a small dab to make it work. The gel dries pretty stiffly, so you don’t want to overdo it. On the bright side, it helps to tame even the most unmanageable hair, and the alcohol-free formula works to preserve moisture in your hair. 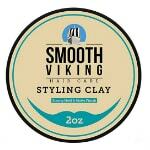 Looking for the styling clay that gives you a strong hold without adding sheen? That is the product just for you! Aveda hair gel for men will give your hair shape, texture, and volume with a naturally-looking matte finish. Hair feels so soft and natural that it’s hard to believe you’ve actually used any styling product on it. Just the spicy, rich aroma may give this product away. The product contains castor oil, babassu seed oil, soybean oil, and more. Its thick formula helps to create pretty much any hairstyle you want – all without that shiny, sleek look. The product is easy to wash off with just water, so you don’t have to shampoo your hair every day. Even though this clay is on the expensive side, it lasts a long time. easy to wash off with just water. This Redken hair gel for men is advertised to provide your hair with maximum staying power. It does have a firm hold, but not the hardest one. If your hair is light and soft, this gel should work just fine – just don’t overdo it. For thicker hair, you may want to get something with a stronger hold. Also, if you live in a dry climate without a lot of humidity, this product will probably maintain a strong hold throughout the day. But it’s not very helpful in hot humid weather. Anyway, it’s worth to give it a try. 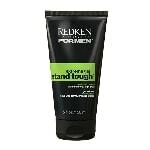 Not only the Stand Tough gel creates shape, but it also adds shine and definition to your locks. My clients who use this product have no problems with washing it off. 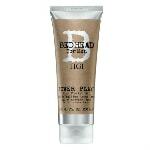 They note that hair may feel a bit stiff or sticky, especially if you apply too much of the product. If you prefer a softer feel, comb your hair after it has dried. The gel doesn’t leave any noticeable residue which is a big plus. Since you need a small amount of the product, the tube will last long. not helpful for regions with hot, humid weather. This styling gel promises to hold your hair almost like a glue. When it’s still a gel, some people actually use it to secure a lace front wig, and as far as I can tell, the product serves this purpose pretty well. Also, it’s a great styling gel for vertical hairstyles that gives you that glue-like hold, keeping your hair in place. 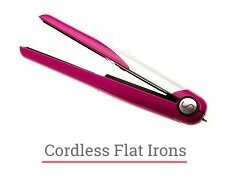 Not only does it hold hair strongly but also adds texture to it. Generally, this gel doesn’t flake, but in rare cases, there may be some flaking. One more flaw – it’s fairly slow to dry. If you have enough time to style your mane, that’s okay. But when you’re in a hurry, it’s better to skip styling or go for another product that dries faster. 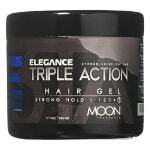 This Got2b professional hair gel for men can be washed off easily with a little shampoo, but just water isn’t enough. On the bright side, the tube lasts a long time, so it’s quite a bargain. adds a bit of texture. 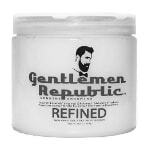 Designed specifically for men, this hair gel will give you that strong hold without making hair feel stiff or greasy. Just like many other hair gels, it does dry to a crisp. Just comb your hair after applying the product, spritz with a little bit of water, and smooth it in place. The hold should withstand the wind and the humidity. The alcohol-free formula contains vitamin E that helps to protect your hair against damage. Also, this TIGI hair gel helps to control frizz, so, as for me, it’s the best hair gel for curly hair men. It doesn’t flake, and hair doesn’t look greasy. If you prefer styling products that give your mane not only firm hold but also that glossy shine – you should give this one a shot! There is a whole line of the L’oreal Paris hair gels, and this is one of them. It promises maximum hold, ultimate control, and long-lasting results. Indeed, this product has a strong hold without being too sticky or heavy. Just a little dab will do the trick. For the maximum hold, follow it up with a blast of cool air from a blow-dryer. 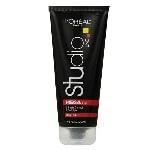 This L’oreal hair gel for men is an excellent product for short hairstyles. Hair keeps its shape, looks shinier, and doesn’t look wet. For medium-length hair, the gel doesn’t work that well – it may start losing the hold after a couple of hours. One more flaw – the gel gets sticky in humid weather. On the bright side, it washes out of your hair and off your hands rather easily. Also, this gel doesn’t dry hair out, and your hairstyle looks pretty natural. may get sticky in humid weather. Good news for those who prefer natural cosmetics – this Garnier hair gel for men is 98% naturally derived. It contains acacia gum that is known for its natural holding properties. 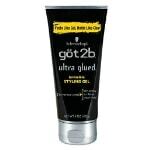 The gel offers you strong hold for up to 24 hours indeed, especially on fine to normal hair. For thick hair, it works okay, but you may want to find something with a greater hold. On the bright side, this product doesn’t leave that nasty residue or flakes after styling. Also, this hair gel can help to control frizz and make curls more defined. The gel isn’t sticky, yet don’t overdo it. It dries a bit stiff at first, especially if you use too much of it, but it loosens up afterward. Plus, it’s easy to wash off. The scent is light and pleasant, and the price is attractive – what else could you ask for? may leave baby fine hair looking oily and flat. This product is recommended for all hair types, including curly, straight, and color-treated hair. It promises to provide you with a great hold and long-lasting shine, and it does the trick pretty impressive. With this hair gel, there is no need to worry about your hairstyle – you get strong hold with all-day control. Plus, its alcohol-free formula protects your hair against humidity, controlling frizz and keeping your style locked. The gel contains panthenol (aka provitamin B5), wheat protein, jojoba seed extract, and more. It doesn’t leave hair looking sticky or wet. Although, there may be flaking. On the bright side, the product can be washed off easily. To enhance the results, it’s better to use it along with other TRESemmé products like shampoos, conditioners, and so on. For instance, you can finish off your style with the TRESemmé no-frizz ultra light shine spray for extra shine and frizz control. I highly recommend this styling gel for medium-length or shorter hair. It will give you the strong hold that lasts all day without flaking. Odds are, you will wake up the next morning with the same hairstyle. The gel features an alcohol-free formula to avoid drying your scalp or hair. Also, it’s a good enough hair gel for humid weather. Depending on the amount you apply on your hair, the shine is versatile. Actually, all you need to style and go is just a small dab. The gel may feel a bit sticky on your hands, but it’s easy to rinse off. Plus, hair doesn’t feel oily or crispy. Finally, a piece of advice – don’t leave the lid off for too long since the gel dries out very quickly. Recommended for normal hair, this gel promises to give you a medium hold. In fact, I have some clients who note that it holds even thick hair pretty well. And just a small amount of the gel will do the trick. Obviously, thicker and longer hair may require more product. Keep in mind that if you put too much of this gel in your hair, there may be some flakes on your shoulders, but nothing too serious. When used in moderation, this hair gel doesn’t flake. The alcohol-free formula is meant to prevent drying of your scalp and hair. The hold is great, and it can last all day long. With a small dab, hair looks pretty natural, and sometimes you can’t say whether there is any styling product whatsoever. Hair is neither crispy nor stiff. Also, the product is fairly easy to wash out. It helps to create volume and eliminate frizz – not bad for a hair gel, huh? may flake, if you use too much of the product. If you like your hair to have the strongest hold and extra shine, go for this product. It promises to provide the maximum hold throughout the day while making your mane shinier. Just like with many other hair gels, you need a small amount of this product. One pump will keep a relaxed hold, and two will give you a good solid hold. The gel is said to be suitable for all hair types. It doesn’t flake, and you can wash it off easily. The scent is okay, and it wears off quickly, so it smells like nothing after a while. Unlike the scent, the hold lasts throughout the day. This gel adds a bit of volume, texture, and thickness to your mane for an even cooler look. I particularly like the refreshing fragrance of this product. Actually, this strong hair gel for men has it all – it gives your hair an extreme hold, long-lasting shine, and great volume. The hold lasts throughout the day without flaking or that greasy residue. This product can tame even coarse hair which is typically hard-to-manage. It doesn’t dry hair but can make it a bit crunchy. On the bright side, the gel doesn’t take much time to wash out which is one of the key features. hair feels a bit crunchy. 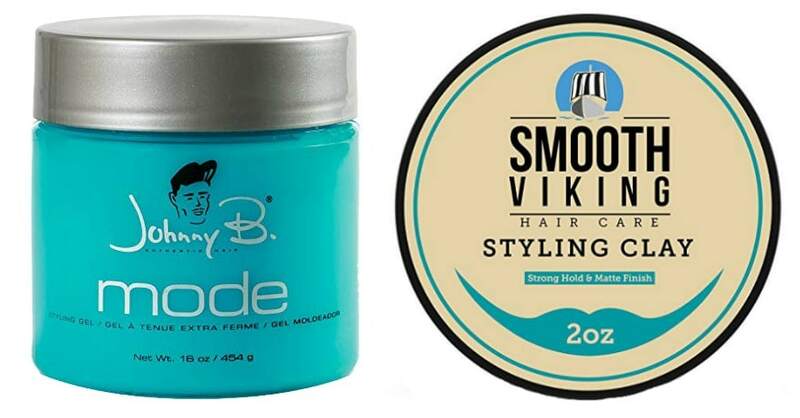 Smooth Viking is a relatively young hair care brand that seems to have caught men’s fancy all around the world. Their styling clay is a great styling product for thick curly hair that is hard to tame. It will give you that strong, yet flexible hold that lasts all day long and maybe even the next morning. There is no flaking, no residue, no greasy feeling. And if you prefer to have a matte finish rather than shiny, glossy one – the product is totally for you. The formula is strong enough even for those with an active lifestyle. 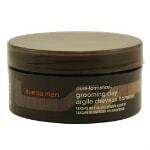 This styling clay helps to add a bit of volume and texture as well as tame frizz and flyaways. Also, it lets your hair curl naturally. It dries fairly fast and doesn’t make hair feel sticky. Many consumers note that you can wash the product out with just water which is extremely handy in some cases. The scent may seem too strong or kind of medicinal to some people, although others claim that there is almost no scent at all. If you prefer your hair to look natural, consider trying out this hair gel by AXE. It will give you medium hold which is, however, strong enough to keep hair in place throughout the day. Even when exercising or being outside in humid weather, you don’t need to worry about your hair – it looks just perfect. What’s more, hair is soft to the touch and manageable, with added body and texture. Isn’t that a dream? You need just a small dab of this product, and I mean it – just a little bit. If you use too much of it, hair may feel sticky. The gel dries very quickly, and it doesn’t flake. It works wonders even for thick hair, giving it a decent hold that lasts all day. Last but not least, the price is pretty attractive. It’s not the cheapest hair gel on the market, but the price is competitive for sure. 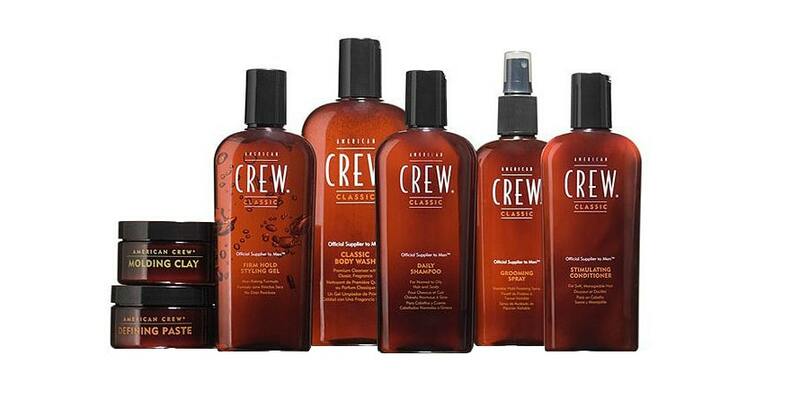 The well-known American Crew hair gel for men provides a fairly strong hold that lasts all day. It’s made with natural extracts like provitamin B5 (aka panthenol) to make hair look thicker and add extra shine and body. Also, it has a low pH to prevent drying of the hair and the scalp. The gel doesn’t flake, and it holds up well even against high humidity. Folks from Texas, South Florida, and other regions with humid weather will probably appreciate it. The gel has a thick consistency, so you need just a small amount to style your mane. It lasts a long time, and considering the price, it’s quite a bargain. The product washes off easily, but if you spill it onto the counter, it may be hard to scrape off, when the gel already hardened. You’d better clean it up as soon as possible. Although, I guess many hair gels have the same shortcoming, so it’s not a key factor. The point is, this hair gel for men works like a charm! difficult to scrape off a surface once the gel has hardened. Homemade Hair Gel for Men: How to Make It and What Are the Benefits? It seems that you like my posts with recipes for DIY hair products, so this one won’t be any different. If you want to be 100% sure what is your hair gel made of and have some leisure time, try to make it on your own. And here is my favorite recipe which is easy as pie. A few drops of essential oils (optionally). Heat the water in a pot or a pan to make it lukewarm. Don’t bring it to the boil. Remove the pot from the heat and stir in the warm water with gelatin and aloe vera gel. You can also add essential oils beneficial for your hair type. Stir all the ingredients so that the mixture is neither too thin nor too thick. If it happens to be thin and watery, add a bit of gelatin to make it thicker. Keep in mind that this homemade hair gel will last not more than two weeks in a fridge since there are no preservatives. Keep the mixture in a jar with a lid. Tip: You can store your DIY hair gel in an old store-bought hair gel container or a small Tupperware bowl. Are hair gels for men any different from those for women? Generally, hair gels for men are designed specifically, well, for men. In other words, these are products for short or medium-length hair of a particular texture. 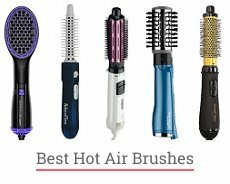 They are meant to give your undercut or once-over the much-needed hold and shine (the last one is optional, depending on the hair gel you use). Also, the distinctive feature of men’s hair gels is the fragrance – it’s usually brutal and masculine. Although, there are some unisex hair gels with a gender-neutral aroma. How often do I need to wash my hair when using the hair gel? Depends on how often you use the gel itself. The general rule here is that you should go to bed with clean hair and scalp, free of any styling products, including hair gel. Otherwise, the gel can clog the pores of your scalp which is definitely not a good thing. How harmful are hair gels to my hair? In general, modern hair gels aren’t very harmful. Quite the opposite, many of them contain ingredients like vitamins A and E, panthenol, essential oils, and others that are beneficial for your hair. The gels with non-alcoholic formulas are better for your hair health since they don’t dry your scalp and hair. On the other hand, you definitely should not overuse hair gels – just like any other styling products. Make sure to wash your hair before going to sleep and choose from the products that contain minimum harsh chemicals like silicones, parabens, and so on. Try to reduce usage of hair gel when it’s not that necessary. Your hair will be happy to have some days off, so to speak. How to remove the hair gel properly? First, rinse out the gel with lukewarm water. You don’t want the water to be hot – in this case, the gel may melt and stick to your scalp. The lukewarm water will loosen the gel, allowing it to run freely from your hair. Second, gently wash your hair with your regular shampoo to remove the rest of the product. You may need to wash it twice or even more to ensure that your hair is absolutely clean. Finally, rinse it with cool water that will lock the cuticle and the pores in your scalp. If you use styling gels on a regular basis, it’s better to wash your hair with a good clarifying shampoo once or twice a week. 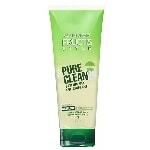 It’s meant to remove the residue and build-up caused by styling products. Also, follow up the clarifying shampoo with a moisturizing conditioner to replenish the moisture. So, do you need a strong hold for your hairstyle? Then hair gel is a must-have for you. 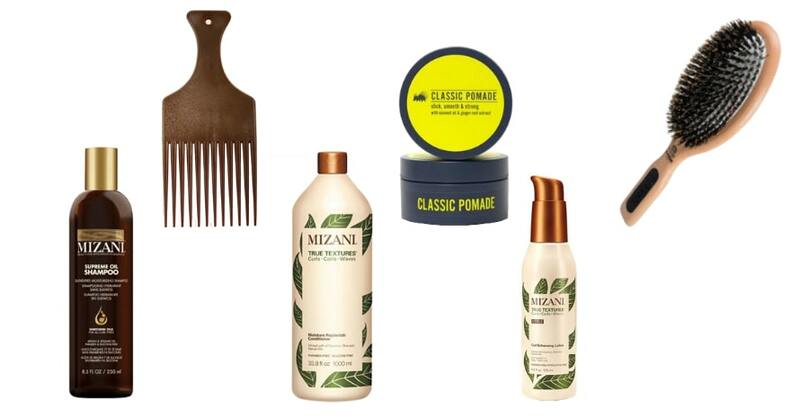 Choose from the variety of products, depending on your hair type and texture. There are hair gels that will give you the ultimate shine – or the matte finish. Some will protect your style against humidity and wind while others will make your hair naturally-looking and soft to the touch. The choice is up to you! And if you don’t trust store-bought hair gels for whatever reason – you can make one all by yourself. You will need the minimum of ingredients, and you can be sure that there is nothing harmful in your homemade hair gel. Just remember about the right storage conditions. A good hair gel shouldn’t do any harm to your hair. Still, carefully read the ingredients before purchasing and follow the directions. From time to time, use a clarifying shampoo to get rid of the build-up caused by hair styling products. All in all, take good care of your mane – and odds are, it will stay strong and healthy. So, what is the best hair gel for men, in your opinion? Do you prefer a wax, a pomade or a hair gel spray for men to keep your hairstyle perfect? Have you ever tried to make DIY styling products? Feel free to leave a reply below!